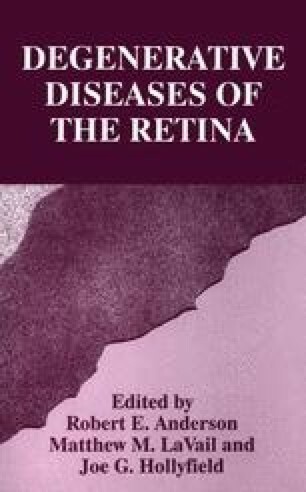 The Royal College of Surgeon (RCS) rat is an animal model for Retinitis pigmentosa (1) with a still unknown genetical defect. In order to find a candidate gene which also serves as candidate for human retinitis pigmentosa, the functional defect in the retina of the RCS rat has been intensively studied. It has been shown, that the defect is located in the retinal pigment epithelium (RPE). Using cultured RPE cells or in situ preparations of the posterior eye (2&#2013;7), it has been demonstrated that the RPE of RCS rats is unable to ingest shed outer segments of the photoreceptors. The RPE is able to bind the outer segments of photoreceptors to the apical membrane but fails to incorporate them (2). Several lines of evidence show that in the RPE of RCS rats the second messenger system is disturbed which regulates the phagocytosis of photoreceptor outer membranes (5-8). Normal phagocytosis of photoreceptor outer membranes is regulated by calcium and the phosphoinositol second messenger system (9–11). Light stimulates the onset of phagocytosis of photoreceptor outer membranes which is associated with an increase of the phosphoinositol lipid concentration in the cytosol of the RPE ( 10). An increase of the cytosolic free calcium, which leads to activation of protein kinase C, represents the “off” signal for phagocytosis (9). Both mechanisms contribute to the fine regulation of phagocytosis of photoreceptor outer membranes in the RPE. The unspecific phagocytosis of for example latex microspheres is not regulated by this second messenger system (12). It has been reported for RCS rats that the second messenger system of the RPE cells is disturbed. An abnormal phosphoinositol generation (8) and a reduced cAMP production has been reported in RCS RPE cells (6). As consequence to these findings the RPE in RCS rats expresses an altered growth factor responsiveness (7, 13) and protein phosphorylation (5). In addition, the regulation of photoreceptor membrane phagocytosis may also be misregulated.